Create new profit centers in print display, classified, and Yellow Pages directory advertising . 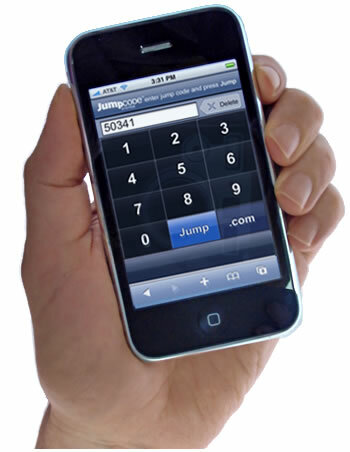 . .
Move Beyond SMS Common Short Codes (CSCs): The Jump Code System extends the reach of your current mobile advertising programs by linking print and broadcast online for consumers worldwide, using any Web device . . .
at their peak moment of interest in your product, brand, or promotion . . . In today’s economy, your advertising must provide the consumer with a strong, value-based incentive to buy. And the best way to engage consumers when they become interested in buying your product is to link them to the offer or information they need to see before they buy, online: The Jump Code System is the best, fastest way to help you build these strong call-to-action promotions into your advertising program, to boost the selling power and measurability of your advertising in these challenging economic times. As a consumer advertiser you’re facing the challenges of reaching today’s consumers with your traditional advertising, getting better returns and greater measurability from your print, on-air, and other “offline” advertising—especially in today’s tough economy. You’re looking for better response, ROI, and more precise measurability from your advertising programs. The key to getting better response and measurability from traditional print, on-air, product packaging, point-of-purchase, and other “offline” advertising is to link these ad placements to targeted savings, product detail, and other promotions at specialized Web locations, such as targeted landing pages or microsites, accessible at long “deep URLs” that would be difficult or impossible for consumers to enter by hand. Now, with the Jump Code system, you can develop far more effective Web locations custom-targeted to the promotional offer, coupon, savings offer, free sample, product detail screen, or any other promotion reachable from any print, on-air, or other “offline” ad placement, to engage consumers the moment they become interested in your product, from any device they’re using: PC, Web-enabled mobile phone, or smartphone. NEXT: How to Make Your Advertising a Measurable Investment in Higher Sales, with the Jump Code System . . .